Watched by Gambit, Jubilee & Yukio, Wolverine continues his vigil at Mariko's grave, fighting his grief and urge to lose control. In New York, Sabretooth is attacked by Shiva at a wrestling match. On a nearby subway, muggers confront John Wraith, who are in turn harassed by a group of Skinheads, but Wraith scares off both groups. In Japan, Matsu'o tests out his new hand, ignoring the pleadings of his ninjas to leave the country before Wolverine extracts vengeance. 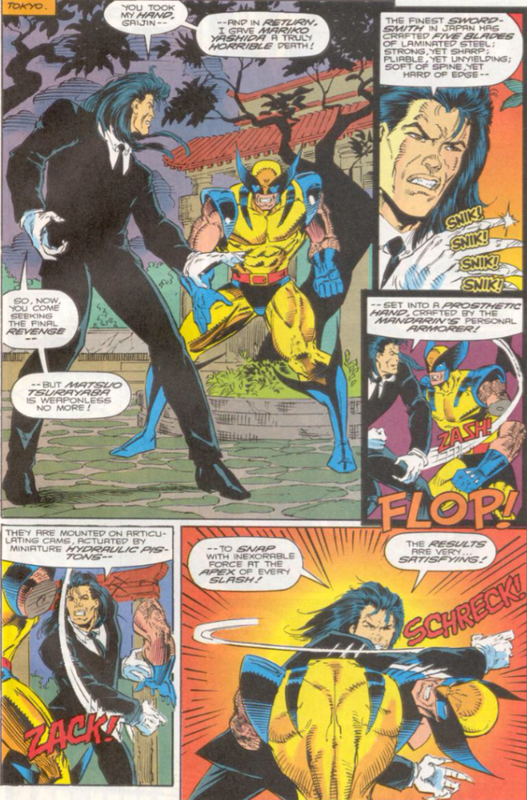 Sunfire arrives at Mariko's grave, passing along his government's request that Wolverine peacefully leave the country. 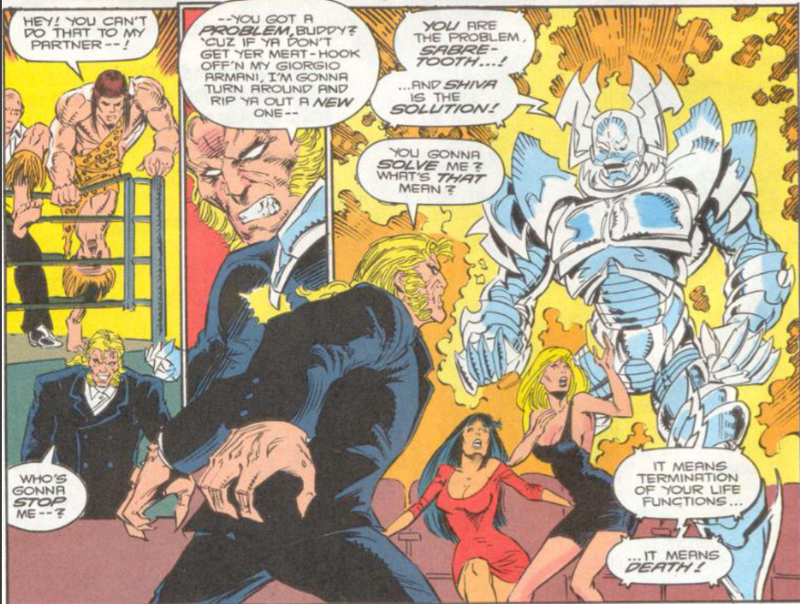 In New York, Sabretooth manages to destroy one Shiva robot, but is attacked by a second. He is saved by Wraith, who destroys that robot and teleports away with Sabretooth. In Japan, en route to the airport, Wolverine catches Matsuo's scent. He tracks him down, defeating his ninjas and destroying his new hand. He then slices Matsuo's face, telling him that rather than kill him, he is simply going to return each year to mutilate him further, taking a slow revenge on him. John Wraith, aka Kestrel (though he's not yet named that here_, appears for the first time in this issue. Mentioned previously (via the name Kestrel), Wraith is another member of the Weapon X project that produced Wolverine and Sabretooth, who received similar memory implants and manipulations. He has the mutant ability to teleport, and you may remember him from when he was played by Will.i.am in the terrible X-Men Origins: Wolverine movie. As vengeance for orchestrating Mariko's death, Wolverine tells Matsu'o that rather than kill him, he will return every year on the anniversary of her death to take cut off another piece of him (here, he seems to slash his nose). Though we won't actually see any of these subsequent attacks, issue #175 confirms that Wolverine does keep the tradition alive. Shiva, last seen in issue #50, returns here, targeting Sabretooth (as was teased in #50). 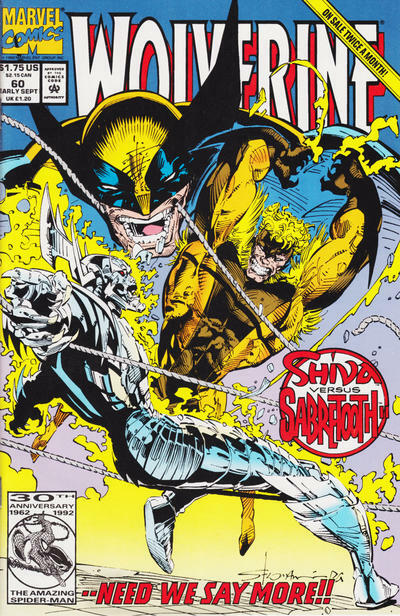 Shiva forces Sabretooth to recall a memory in which its strongly suggested that he is abusive Wolverine's father, angry that Wolverine is getting involved with a Native American girl (Silver Fox), all of which turns out to be a false memory. Flashbacks in this issue continue the story of Wolverine, Sabretooth and Maverick after their first encounter with Omega Red, as shown in X-Men #5-7. We see them being retrieved by Wraith, who tells them to go on without him as he's decided to take on Omega Red himself. Barrington, who was mentioned in Maverick's back-up story in X-Men #10-11, suggesting he is connected to the Weapon X project as well. A footnote at the beginning of the issue says that this story takes place before the story in issues #58-59. 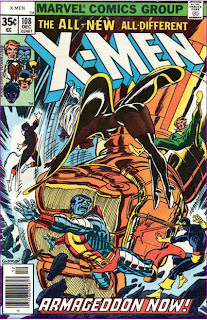 Former X-Factor penciler Larry Stroman provides the cover for this issue. A grieving Wolverine grapples with his memories, and the spiky painscape is seen once again. 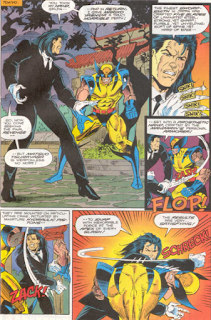 When he first appears in the issue, Sabretooth is wearing a suit, with Hoover presumably taking the lead from Jim Lee when Sabretooth first appeared in X-Men #6. Matsu'o receives a new high-tech hand this issue, though it doesn't perform as well against Wolverine as he'd hoped, and he loses it again by issue's end. The art is a little dodgy (Dave Hoover had a lengthy run on Captain America around this time which I've never loved, but like more than this), but otherwise, this is exactly the kind of issue the series needed after the death of Mariko in issue #57, giving Wolverine a chance to take a beat and grieve before launching him into his next adventure (it's perhaps unfair to hold the dictates of scheduling - especially when the book is shipping bi-weekly - against issues #58-59, especially since this issue makes it clear they take place after this one, but that's how the issues were published, and how anyone reading them in real time would have read them). Wolverine's decision regarding how to exact his revenge on Matsu'o effectively sidesteps the limitations of the genre - Wolverine can't just kill him because Matsu'o needs to stick around for future stories - with a solution that doesn't feel cheap (and genre-mandated) and still affords some measure of satisfaction for Wolverine. Toss in the parallel events involving Sabretooth being targeted by Shiva, a return to an ongoing plot that's been mostly shelved over the last eight issues, and this marks an appreciated return to form for the series following the forgettable Chichester fill-in. Next week, Unstacking the Deck and the first series of Marvel Masterpieces. Back in the comments for X-MEN #7 I tried suggesting that there might have been a part of pre-planning in Matsu'o losing his hand harking back to UNCANNY #256 and his ill-fated "Whatever happens to one hand" speech to the Mandarin. Whether or not it was so, here's he dropping the name of Mandarin's (personal armourer) out of nowhere as the crafter of his prostethic hand to replace the one lost in the perfectly non-Mandarin X-MEN #7. That considering, it's funny that in #258 we found Wolverine quoting Jack Nicholson's Joker to Mandarin, and now he getting all Chinatown on Matsu'o's nose here. Kudos on the work done for the bit about the finest swordsmith in Japan making the five blades for the hand because katanas very much are made of laminated steel forged so that there's hard steel on the edge to keep the sharpness and soft spine to take the impacts without shattering. Of course, thinking about it now I don't know if there's any sense in doing a finger-blade that's used very differently to the same specs but cool tidbit nevertheless. Wraith gets a damn cool introductory scene for himself. ... and whoah! This just in: Matsu'o is comparing his technology-given weapon to those created by Wolverine's "genetic deviation". 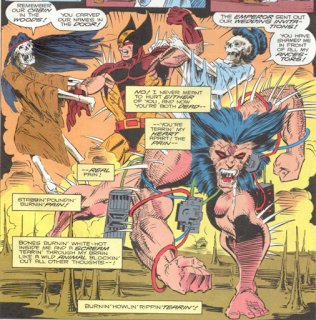 This far we've been led to understand that the artificial full metal claws were given to him by the Experiment X. Windsor-Smith's WEAPON X had the bit about adamantium amassing around Logan's wrist areas, but isn't this here the very first suggestion that Wolverine's claws are natural? Furthermore, how would Matsu'o know? It was left vague if even the Professor knew (probably didn't, judging by them not telling him that Logan's a mutant). Someone's chatty in the Department H(ydra)? Someone who recently have been hanging with Matsu'o and goes back to the Team X spy days with Logan? Looks like Sabretooth wasn't the only one suspecting that there were supers (like Wraith) in the outfit. @Teemu: As for Matsu'o knowing about Logan's "natural" claws, while I commend your enthusiasm to reinforce my previous theory that Department H was Hydra, could he have discovered when the Hand had Wolverine locked in that sensory deprivation tank on Emil Vachon's island? Or recall Matsu'o was a ninja previously in the service of Ogun in the Kitty Pryde & Wolverine limited series, so did he learn from there? That is, if Matsu'o worked in his service, this would seem to suggest Ogun's dojo was a Hand training encampment. It's a hard thing to learn: X-ray would only show the expected metal blades, and Hand surgeons would have had hell of a time cutting open unconscious Wolverine's arms to learn about the tendons and whatnot of the claw extracting mechanism that would give away the original natural nature of his claws. You'd rather have to had met Logan prior the Experiment X shenanigans to really know about it. Silver Fox being a Hydra, alarmed by SHIELD downloading the files about the Exp X plant's location, and with von Strucker having had his own Satan's Claw weapon thingy it just makes too much sense. Much more so than their nonsensical Romulus cover-up. With regard to the execrable Romulus, if Jeph Loeb hadn't introduced him, I wonder who Daniel Way would have chosen as the one that had been manipulating Logan's life? I'm also intrigued as to who Peter David would have revealed had laced Burr's skin with unbreakable adamantium? Did he seek out the procedure after finding out Logan had been weaponised, or did whoever performed the procedure seek him out as a candidate because of his previous association with Logan? Well I was thinking that it was Silver Fox who departed with the inter to Matsuo, that she had gotten either during the old days or then later from the Hydra files on Exp X. BUT now that you mention the Fenris twins (who I had managed to totally forget), considering that they found Dr. Cornelius and were all about finding the C-Synthesizer for to make "cheaper, more malleable adamantium", maybe it's been them to help themselves into daddy's file cabinet. Re: Ogun, he did had some ninja black magic ninja voodoo like the folks of Hand, but one name drop doesn't convince me here. @Teemu: The issue with Silver Fox is we had seen no association between her and Matsu'o prior to this, whereas we had between him and the Strucker Twins if you recall the ending of Uncanny X-Men #268. If what was contained in the C-Synthesizer enabled "cheaper, more malleable adamantium" to be created, and if Team X was looting it back in Berlin for Experiment X, how did it not come to be used on any of Department H's candidates and instead end up used on Arkady? And don't forget Omega Red's so-called "death factor" which was connected to Hydra's Death Spore Virus which they first attempted to release back in 1967 (Strange Tales #156). So if Omega Red was a mutant, and his power was emitting "death spores", which came first? That is, if the Death Spore Virus was manufactured first by Hydra scientists, how then was Arkady's power able to emit a laboratory designed virus? Or was the original DSP derived from Arkady's system? 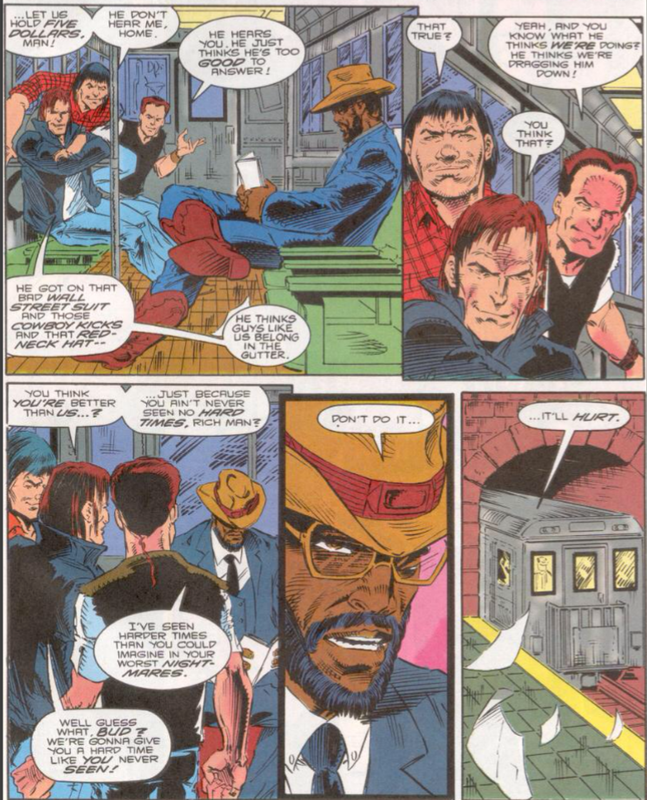 As for "Barrington", when first shown he was had the same silhouette as Nick Fury, including down to the smoking cigar. While Matsu'o serving Ogun at his dojo doesn't convince you it was a training ground for Hand ninja, surely you've got an opinion about who PAD intended to have laced Burr's skin with adamantium? Wolverine buried the C-Synthesizer with Janice's body in Berlin, so it naturally wasn't available to be used in Exp X. It wasn't used on Arkady either obviously, at least after that point. Wasn't their stealing the C-Synthesizer the reason why Arkady was (near-)dead for all those years? Until I get one valid reason to consider Cyber to be anything but a bad dream of Logan's caused by his eating a bad weenie, I won't bother with questions about his skin. Anyway, everyone's free to ignore all the speculative nonsense, but the important bit is that the creators (Hama the very least) seem to consider Logan's claws natural at this point. There was a semi-famous story about how/when they came up with Fatal Attractions and Mags ripping adamantium from Logan's body? Was it PAD's joking suggestion that everyone unexpectedly jumped on? @Teemu: So is it that the C-Synthesizer able to instead stop his death touch? Is that why everyone were after it? It certainly didn't come across that well on the page!? Matsuo: "Now that we have learned it is impossible to mass-produce his healing factor -- your only chance for survival rests in completing the process started thirty years ago." 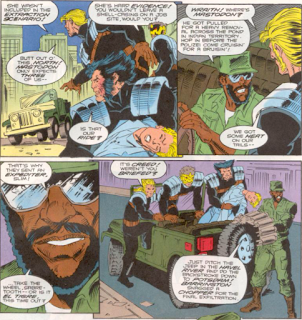 Arkady: "I realize I'm dependent upon synthesizing the only metal capable of negating my death factor..."
And elsewhere, from Team X's lines you can form the picture that their mission was to secure Janice the mole and the C-Synthesizer (not necessarily in that order), with Maverick pointing explicitly at "snaggin' that metal-makin' technology". The Russian supersoldied project is underway as they're there and they're happy at least about setting it back thirty years. 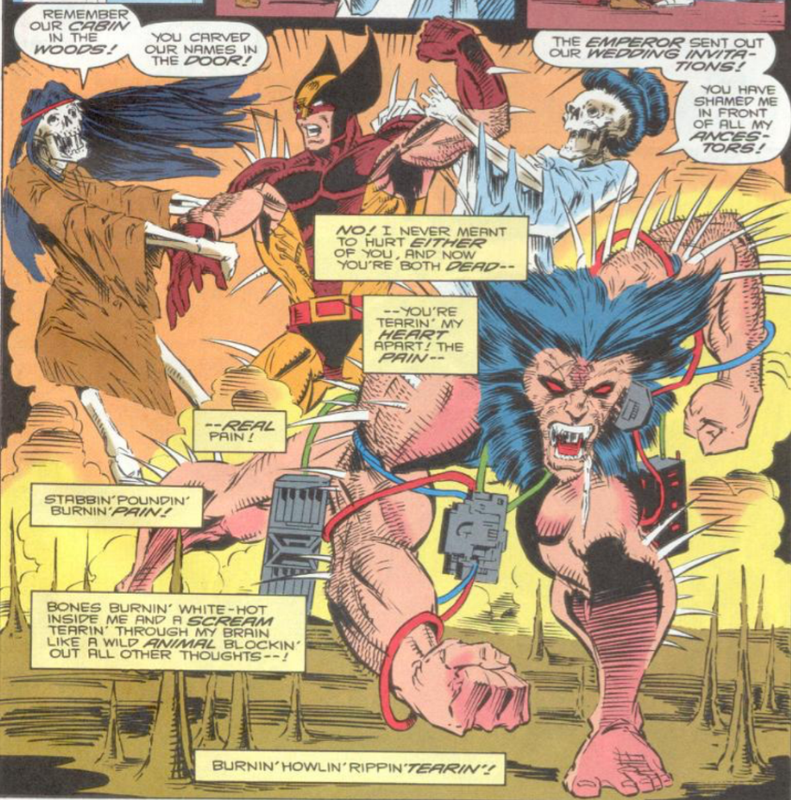 Omega Red's coils are carbonarium, the death factor is a questionmark, but "mutant death factor" could also refer to mutant strain of the "death factor" rather than Arkady's own mutant powers. I don't know. They are either trying to abort the Russian project or leap theirs onwards. Maybe both. It's hazy. But the story gets bad press unwarrantedly for messiness; the idea seems to be that each issue shed more light to stuff and answer the questions in previous one (like: what's the can?). Solid idea at least; if the delivery is a bit messy. @Teemu: With regard to Matsuo knowing here about Wolverine's claws being natural, as opposed to implants, I'd alternatively suggest Psylocke told him during #258. Recall Wolverine had to give her full access to his mind to shock her to her senses. I'd therefore suggest before she turned back, she revealed what she discovered about Logan to Matsuo. So this was a Claremont question. ;-) But just think about the story potential there. Psylocke knows the circumstances of Wolverine's whole mysterious past, and shares it with the then Jonin of the Hand. Matsu'o under Claremont would have become a much bigger threat than how he fizzled out as a villain after Chris was gone. What an absolute wasted opportunity. So the canister with Wolverine's healing cells was a second one, separate from the one containing the Carbonadium Synthesizer? Wow, the pages certainly didn't make that clear! It would seem to be a Jim Lee issue, equivalent to one only issues earlier with the Delgado/s!? And if Omega Red was concerned about his death factor, weren't his implanted coils sufficient to do that given they were composed of carbonadium? So why all the fuss? As for his "death factor" being his mutant power, recall SLobdell revealed it to be the Death Spore Virus. Given it is also referred to as his mutant power, this would seem to suggest that the Death Spore Virus manufactured on a massive scale for use by Hydra in Strange Tales #156 was harvested from Arkady's body by Strucker or Hydra scientists on his behalf (than the other way around). About Omega Red, the process was only underway when the Team X ruined everything. Arkady was seen in a very Experiment Xesque tank. We'll see later on WOLVERINE how Wraith tangles with Omega Red whilst covering for Team X's escape, so likely Omega Red was awaken half-baked in mid-process, which necessitated his needing life-force constantly to keep alive which in turn probably was the reason why he was put to hibernation thirty years back until woken up by the Hand "ritual". Pre-Omega Arkady was probably a known figure in their agent circles, judging by how every knows him by look. And yes, Wolverine shows up with a mysterious canister, and only in the next issue we're told it had got half of his blood (and the healing factor cells) in it. C-Synthesizer was in Janice's grave the whole time until it was dug up in the finale/epilogue. Learning of the whereabouts of the C-Synthesizer was the main reason why Fenris/the Hand hijacked Wolverine and the info was dug up from his mind. @Teemu: So when exactly did they obtain Logan's blood and healing factor cells for placing in a second canister? Did they obtain that off Dr. Cornelius? And why would it even be considered of use? That is, blood can only be stored for 42 days if not frozen, and when frozen it can only be stored for 10 years but is a really poor way of storing it! 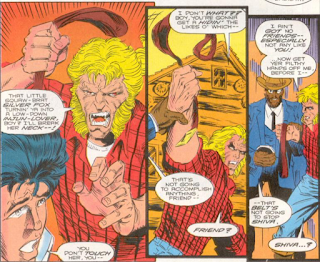 Logan was captured in X-MEN #4 by Omega Red and before Maverick breaks him loose in #5 (carrying the can) he has spent some time as Cornelius' and gang's prisoner/guinea-pig. They've done memory probes to find the C-Synthesizer and pumped out "half of his blood", which later is revealed to have been about finding if the healing factor could be used to stabilize Omega Red. It couldn't. Now that I checked it's also shown/told on-panel in X-MEN that the Soviet's did indeed activate Omega Red upon the Team X assaulting. @Teemu: So if the Soviet's activated Omega Red the first time, who conducted the experiment on him, implanting the carbonadium coils? #7 pg. 3 shows Janice Hollenback watching Arkady in the tank all sonded up with two males: a bald classed possibly moustached somewhat plump guy with a bowtie in the forefront and a no-nonsense Russian kind of guy a little bit more back. No one we should know I guess. In Avengers #326, Tony Stark suspected Ramskov was part of a USSR weapons programme. So I wonder if this was the same programme Omega Red emerged out of? And given that was connected to the Chernobyl incident, might Doctor Neutron and Meltdown cut their teeth assisting on earlier iterations of the programme, such as Omega Red's? In X-Men #4, Arkady refers to Wolverine as Logan which is kind of odd that Wolvie would use his real name on a covert mission. Or did Arkady know him long before he became a candidate for Russia's super soldier programme? If so, why have we not yet seen this tale? Also, if Maverick was intended as a mutant why, in issue #5, does he refer to Logan with the derogatory term "mutie" if he's one himself? And going by his own admission in X-Men #6, why does Omega Red require the carbonadium coils as a conduit for his "death factor" if he's also capable of releasing it as lethal pheromones into the air!? And when Janice mentioned that Omega Red had been "activated" in this same issue, did she mean for his first mission since it would otherwise seem odd for a Russian "super soldier" to have been experimented/ implanted on German soil? Was the "project" some partnership between the USSR and East Germany? If so, it would seem unlikely for Strucker, a Nazi, to have any involvement in a Communist-run programme!? Both know each other's names and address each other with them; right before the Berlin raid Logan is looking at Arkady's pic from Red Army; pg. 22 in #5 Red refers to Logan as "my old friend". The pic itself may be from an intel file about the project and the candidate, send to them by Janice, but to me a plausible scenario would've been that either one or other had worked as a double agent at some point very close to the other one. As per Madripoor Knights, Logan at least can speak Russian. Pg 3 in #7 Creed notes vocally: "Never did trust double-agents anyway." He's right next to Logan while looking at Arkady's tank; immediately it's about Janice but it may have been a jab at Logan, either about him or Arkady. Berlin is a good place for the project because they may have had the tech and technicians around from the days of the Nazi supersoldier pojects of Master Man and Warrior Woman, whom von Strucker was in charge of putting into suspended animation at the end of WWII. Post-war von Strucker wasn't so hellbent with Nazism; Hydra gradually becomes a non-ideological criminal organization and being a part of the supersoldied scene is good for the business. They're interchangeable deprived scientists all around who do it anyway; the Professor and Cornelius on their part certainly weren't stalwarts of freedom and democracy. The ideologies are for propaganda posters for them. Omega Red is a mirror image of Wolverine: a mutant with death/healing factor implanted with metal appendixes and turned into a super-soldier. Who knows, maybe Arkady had natural coils that got marred with carbonarium in the project. @Teemu: Re: your suggestion of Major Barrington being Baron Strucker, was that Wolfgang's face on panel 8, page 10 of X-Men #5? 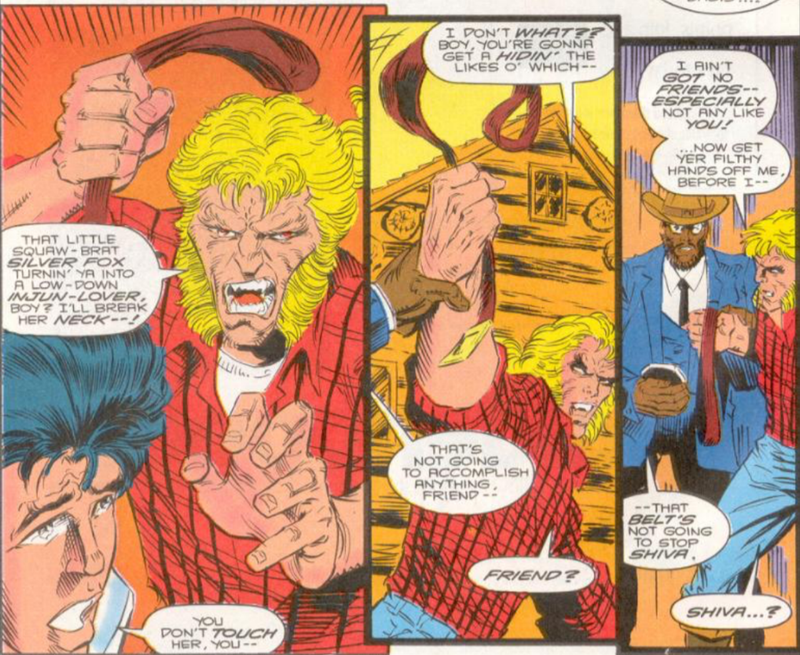 Also, in X-Men #6 Sabretooth states "This whole job stinks of a set-up!" so how could that be if as you suggest Team X was in Berlin to loot the C-Synth for use in Experiment X? If this wasn't the case, what was their true purpose for being there? To provide Omega Red with mutants to demonstrate his upgraded weaponisation against, to help leaders of the programme get extra funding to create more? "Suggestion" is such a nice word for throwing crap at wall to see what sticks. ;) It could be the Baron or then not. We only see a lower half of a clean-shaved face. (so, at least not Nick Fury ;) ) Plus in the STRANGE TALES story there was that delightfully Silver Age instant plastic surgery technology used by Strucker to pose as the SHIELD agent Bronson so what we think we see doesn't necessarily matter. And, about von Strucker's possible involvement to the various projects: the super-soldier projects read like an allegory to the atom bomb. The Americans had theirs ready first during the WWII, they guy with a big A on his forehead. The Nazis were doing their own thing, and after Nazi Germany fell there no doubt was a race for Berlin to secure their supersoldier secrets not unlike it was with the A-bomb. The Soviet Omega project (the O to counter the A of the Americans) is very likely built on that foundation. Lord Dark Wind in Japan is/was doing his own thing about the adamantium bonding process. Von Strucker as the HYDRA head is probably, like everyone else, keeping an eye on everyone else's project through hefty use of double agents, and everyone are likely drawing more or less from the same pool of sources and mad scientists anyway. Omega Red probably wasn't a Strucker-lead show. Maybe the reason why Logan chose to hide the C-Syntheziser in the first place was that he had silently come to the same conclusion as Creed about it being a set-up and he felt it was better that no one got it because he's such an innocent soul and doesn't really have stomach for this crap. Maybe that was what got him picked to be the one to be turned into the psychologically conditioned Weapon X: his self-consciousness combined with all the intel he had amassed had made him a liability to his superiors. 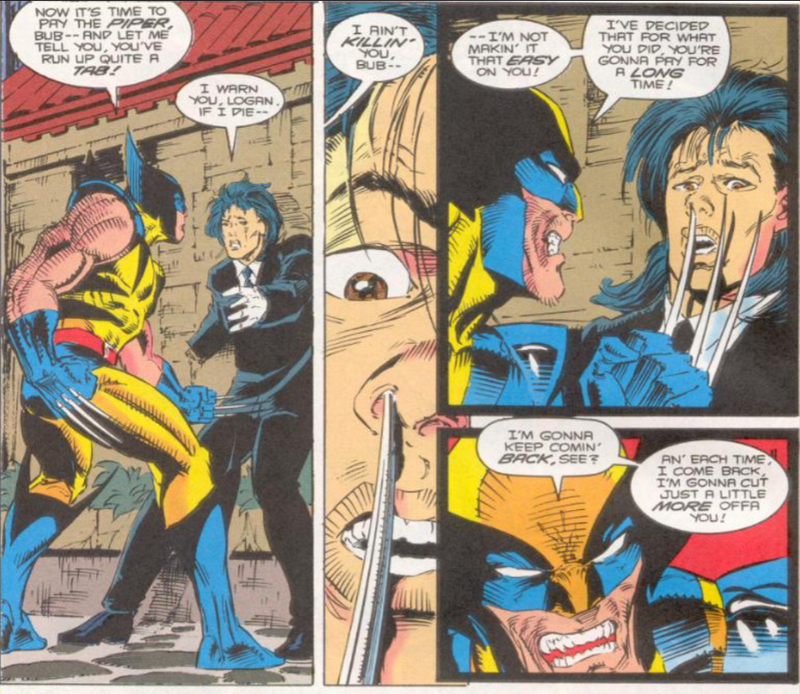 The healing factor obviously maybe had a part in it, too, though a regular person maybe should be expected survive the experience judging from the Experiment X folks went on with the project despite their superiors not disclosing them that Logan was a healing-powered mutant. Why and how it was a set-up... maybe the one giving Team X the botched orders felt that the Soviets would have uses for a bunch of captured super-soldier-project-usable mutants? Maybe they were planning for the C-Synth to "disappear" during the hubbub to other use than Soviet or Western super-soldier projects? Maybe Janice was a triple-agent with intent of luring the handy collection of Western super-soldier candidates to be eliminated/captured which Creed came to realize and shot her for that reason? The 'shoddy "intelligence" leading them to a no-win situation' that Creed afterwards blasts about probably came through Janice. @Teemu: Good point about the Epiderm-Mask, although the silhouetted grimace and stogie chomping would likely have undermined its integrity. The youthful appearance (I don't mean young here, but rather not ancient) at the time suggested to me it might be Nick Fury himself. Recall when introduced into the modern age in Fantastic Four #21 he was working for the C.I.A. (this was before S.H.I.E.L.D.) and was a Colonel. Major is a step down from Colonel, and this adventure was a year or so after Berlin. So it isn't out of the realm of possibility, and the fact that Jim Lee had him in silhouette might suggest it was his intention to imply it was Nick. Although Nick Fury wouldn't approve of using his agents, even if mutant, for helping an enemy state market one of its weapons, so who else might Barrington have been given the cigar-chomping? Another question that comes to mind from the flashbacks in those issues is what field achievements did Creed have behind him such that the C.I.A. would make him team leader of a black ops unit? He wasn't exactly a model of restraint one would consider to be a key attribute of leading such a unit!? Re: Lord Dark Wind, it is possible Strucker picked up on that one much earlier given his time in Japan that finally catalysed the establishment of Hydra. It is interesting though that the idea of bonding adamantium to a mutant wasn't initially thought of by the Canadians or Americans, as it was obviously on the cards much earlier by the Russians (or Germans), given they have had to settle for the poor man's substitute of carbonadium for their first effort. One wonders how Omega Red would have turned out if he'd have had adamantium coils instead of carbonadium ones!? Would it have transferred his "death spores" as effectively? Also on the point of his carbonadium coils, going by his own admission in X-Men #6, why does Omega Red require these as a conduit for his "death factor" if he's also capable of releasing his spores as lethal pheromones into the air? That is, this latter method was shown to be just as effective on those in his immediate vicinity just as if he were to capture them in his coils and transmit his "death spores" physically!? In addition, since Omega Red already had carbonadium coils bonded to his skeleton, why did he require the C-synth to "stabilize his condition" since it had previously been used to mould the carbonadium for the coils which enable him to already do this through providing a conduit to secrete his spores to prevent them building up in his system and eventually killing him? On the point of the second canister (obviously a Jim Lee art error stuff up that the scripters tried covering without really knowing what was going on), if the villains in this tale also considered extracting cells from Logan's healing factor would alternatively stabilise Omega Red's "condition", why were they initially so crazily desperate to obtain the C-Synth to do this? While it could have been their Plan-B, they seemed 100% set in each action which in real-life wouldn’t come across in the same way emotionally! Quick re: Creed leading: CIA probably aren't fully trusting the West German visitor Maverick, and Wolverine may be too compromised to be the field leader on this one because of his Arkady connection. We see Creed asking if Logan's gonna zone out when he's looking at Arkady's picture the way he usually reserves only for looking at Jean Grey's pictures. Creed's the guy you'd privately tell beforehand to get creative if there's a surprise hang-up. Also, it may have been a rank thing. Speaking of ranks, it's too much a stretch that "Barrington" would have stayed a Major for three decades so that's fishy. I'm not saying it wasn't Fury, but Major is actually two steps below Colonel; there's a Lieutenant Colonel in between. Though I understand it has been a military custom to address a LC as "Colonel" when a full Colonel or any bigger animal isn't at hearing distance. @Teemu: Also, what if the scientist who came up with the initial idea for implanting coils into Arkady Rossovich was none other than Otto Octavius? He didn't appear in America until July, 1963, over 12 months after this adventure. Was the Omega Red experiment the prototype to his own? @Teemu: A better thought for the Major's identity could be Agent Garrett!? He could have been age extended, considering his cybernetic enhancements. Recall prior to S.H.I.E.L.D. he was C.I.A. So his loss of the C-Synth leads to him being demoted, or perhaps dismissed from the C.I.A., he ends up hitting rock bottom, then gets picked up by S.H.I.E.L.D (perhaps Nick decided to give him a chance at redemption due to their having previously worked on some cases when Nick was a Colonel for the C.I.A.). Then after Elektra: Assassin, he goes back to the C.I.A. or instead convinces Maverick he has and starts trying to put the old team back together to make up for his previous stuff up? I actually liked the Origins movie. It helped that I got out of comics before Deadpool got big, as I could see the movie wanting Wolverine and got Wolverine. I don't think I liked this revenge at the time. Worked better for me on recent re-reading, though, especially knowing that the "muyitilate Matsuo" agenda actually got a payoff in that "Psylocke" miniseries from ... 2010? Took them a while, but they got there! The Weapon X stuff on the other hand, I DID like at the time, and now I hate it. I dig this one now for the "Death of Marino" epilogue. But Shiva and Sabretooth can go hang. I think you mean “Wolverine’s abusive father”; otherwise, Abusive Wolverine has to be one of the least cool action figures ever. If you can’t say anything nice don’t say anything at all, so in situations like this I’m left to remark that I’m sure Dave Hoover’s family loves him. @Blam: Dave passed away unexpectedly back in 2011. You know, as per Jason's mention I went and checked the PSYLOCKE miniseries from 2009-2010. It has got an Abusive Wolverine. @Nathan: Well, $#!%. That makes me sound like more of a schmuck that had I just said I really didn't care for his art. I think I mentioned it a while back when he drew an issue of EXCALIBUR, but later in his career, Hoover became a prolific cheesecake pinup artist. I really like a lot of the ones I've seen. I can't quite explain this, but -- does anyone else think the name "John Wraith" sounds like it should've been created by Grant Morrison?